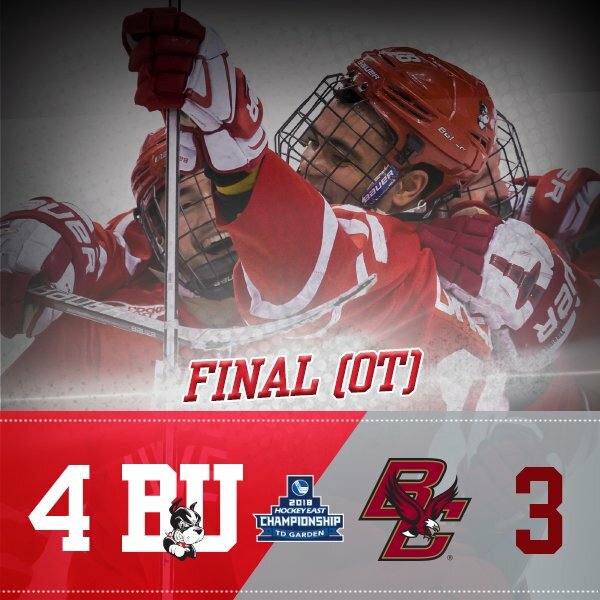 Sophomore Patrick Curry’s goal at 15:40 of overtime sent BU to a 4-3 win over BC in the Hockey East semifinal, keeping the Terriers’ season alive and giving them a shot at the Hockey East title tonight against Providence, which edged Northeastern, also in overtime. It will be the 12th appearance in the championship game for BU, which last won the conference title in 2015. For the second consecutive Friday night, BU needed to erase multiple deficits to force overtime. The Eagles held a 2-0 lead in the second period and a 3-2 lead in the third. The Eagles shocked BU with a goal just 46 seconds into the game. The Terriers turned the puck over in the defensive zone and Graham McPhee dropped a pass to Connor Moore, whose shot from the point hit iron and went into the net. Shrugging off the early punch, BU dominated the rest of the period, holding a 13-5 shot advantage, but couldn’t put one past Joe Woll. Early in the second, BC’s David Cotton corralled a puck behind the BU net and centered it to an unmarked Julius Mattila, who quickly beat Jake Oettinger to the stick side. Five minutes later, Curry forced a BC turnover deep in the BC zone, deflecting the puck to freshman Hank Crone who slid it to classmate Ty Amonte, all alone to Woll’s right. The freshman deked, waited for the netminder to commit and fired it past him from a sharp angle. Less than two minutes later, BU knotted the score on freshman David Farrance's one-timer from the right circle, set up by a slick Chad Krys pass, that beat Woll high to the glove side. Jordan Greenway also assisted. Later in the period, Greenway's wrist shot from the slot appeared to give BU a lead, but a goalie interference call on freshman Brady Tkachuk wiped the tally off the board. It was the Eagles who took the lead with a little more than five minutes left in the third, when co-captain Chris Brown converted a rebound during a scramble in the BU crease. That score was reviewed, too, but was upheld. Less than a minute later, BU answered when Greenway carried the puck down the boards and behind the goal line. He backhanded the puck to Drew Melanson who had position at the top of the BC crease and beat Woll. Farrance also assisted. BU held a 38-25 shot advantage at the end of regulation, but BC dominated much of the overtime forcing multiple game-saving stops by Oettinger. On the game’s final sequence, Bobo Carpenter sent the puck behind the BC goal line. It was recovered by freshman Shane Bowers, who shielded the puck with his body, curled out to Woll’s glove side and slid the puck across the crease to Curry, who banged it into the open side of the net as the Terrier bench erupted. Oettinger stopped 36 Eagle shots to gain the decision over his U.S. Junior National teammate Woll, who had 41 saves. "It's awesome; it shows the depth of our team. If the guys on our top two lines aren't scoring, we've got a whole bunch of guys who can chip in and score and make the big plays. Dave's goal was huge; Drew's goal was huge, and Curry at the end, too. It shows that we have a deep team." - I thought BU was the better team for most of regulation. The shot totals were a good representation of the zone time and scoring chances, with the Terriers up 39-25 at the end of three frames. The overtime was another story, despite BU having the only power play. It was a minor miracle that BC didn't win the game on a shift where the Terriers were out for over two minutes, with no energy left whatsoever. - Quinn played the most aggressive forecheck I have seen him play. BU often had all three forwards at the face-off dots or below, hounding the BC d-men. This strategy paid off on both the opening goal by Amonte (with Curry creating a turnover) and the game-winner by Curry (with Carpenter intercepting a pass). Even the Melanson goal was somewhat caused by an aggressive forecheck. I'm guessing that Quinn felt the BC defense was vulnerable. We'll see if he uses the same game-plan again PC tonight. - The first two BC goals were the result of tough turnovers by BU dmen - Diffley on the first goal and Krys on the second. The second goal was hard to see on the TV broadcast, but Krys tried a backhand d-to-d pass along the boards, but whiffed on it just enough to let Cotton intercept it and feed it out to a wide-open Matillia. Diffley saw limited time the rest of the game. Krys made up for his gaffe with his great pass on the Farrance goal. - I don't think the 4th "line" of Chabot and Phelps saw a single shift in the 2nd or 3rd periods. They each played one shift in the second half of the overtime, and had a good impact. - Greenway was as dominant as he has ever been. It's hard to find fault in his game, but there were several times when I thought he should have fed the point rather than keep trying to beat 2 and 3 guys along the boards. Of course the tying goal was the direct result of his excellent cycling. We'll see how PC handles him - they seem to have more size and speed on defense than BC. - The officiating was a head scratcher. BU would have had a serious bone to pick had they lost that game. I thought the "embellishment" call on Greenway was terrible (should have been a PP, BC scored on that 4-on4 situation, I believe). I also thought the goalie interference call on Greenway was a bad call - he was bumped by the BC defender and still didn't hit Woll hard enough to knock him down. BC scored very shortly after that Power Play expired. And then there were multiple opportunities to call something against BC that didn't happen until halfway through overtime. I knew the Greenway goal would be waved off once I saw how close Tkachuk was to Woll. - Great to see Curry have a big game and get the glory. He always gives a great effort. 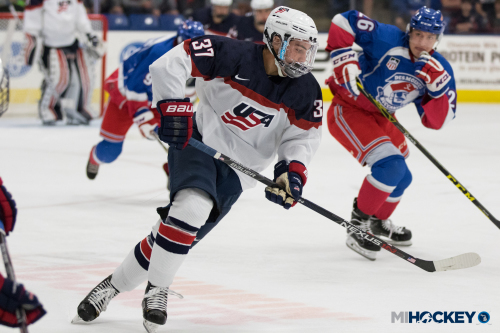 ►This week’s Hockey on Campus podcast features: Adam Wodon of College Hockey News, Wally Shaver of the Hobey Baker Award Committee and Mercyhurst Coach Rick Gotkin. Hockey on Campus airs on NHL Radio (SiriusXMChannel 91) on Saturday morning at 8 a.m. ET and Sunday morning at 10 a.m. ET. You can also find it here on College Hockey News. 2018 recruit Jake Wise’s natural hat trick led the NTDP U18s to a 6-4 comeback win against Madison. The Capitols held a 3-1 lead going into the third period when Wise connected for a power play goal. He added two more goals in the following 11 minutes, with 2018 recruit Joel Farabee assisting on the third tally. Farabee also potted an empty-net goal, assisted by Wise. Despite missing the U18s' first 24 games with an injury, Wise is now seventh on the team in scoring with 32 points in 27 games. Former Terrier MVP Alex Chiasson scored a goal and assisted on two tallies as the Capitals doubled up the Islanders, 6-3. The winner of the Patty Kazmaier Award will be announced tonight. The Terrier record-breaking senior and first-team All-American Victoria Bach is one of three finalists for the award recognizing the top player in NCAA Division 1.